Spartacus in 70mm will be shown twice at the Music Box Theater, Saturday, July 8th at 6;00 p.m., and 2:00 p.m., Thursday, July 13th. It's not only the most overtly political of the great Hollywood epics, it's also newly relevant - a film created in the shadow of McCarthyism, being revived in a time of authoritarian restoration via the alt-right and its bouffanted Crassus, the current President of the United States. I was lucky enough to be in L.A. back in 1991 when the million dollar restoration premiered, and was able to see it with a demonstrably appreciative audience at a Century City cinema. Before the 1960 release, censors had forced numerous cuts, and even more were made for reissues and television. The original negatives had decayed to the point of being useless, and the restoration had to be created from color separations. The 2010 Blue-ray transfer was infamously flawed. A 2015 4K version supervised by Robert A. Harris appears to be much better, but here's a chance to see it - maybe for the last time? - in the original 70mm. Why pass it up? As with Lawrence of Arabia, Spartacus is made up of two very distinct halves. 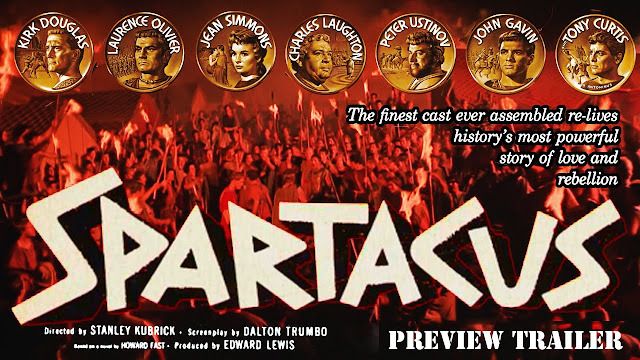 The first is largely made up with extended set pieces - Spartacus becoming a Gladiator, the climatic match between Spartacus and Draba, the takeover and escape from the compound, the assembly and training of the slave army. The emphasis is on action. The second act, again as with Lawrence, is much more telescoped, with a strong counterpoint between the march of the slave army and the politics in Rome, reaching a climax in cross-cut scenes of Olivier's speech his character Crassus has been made dictator by a fearful Rome, and Spartacus addressing his followers on the eve of battle. Crassus speaks in the Forum, with all the pomp and architectural Rome as his backdrop. 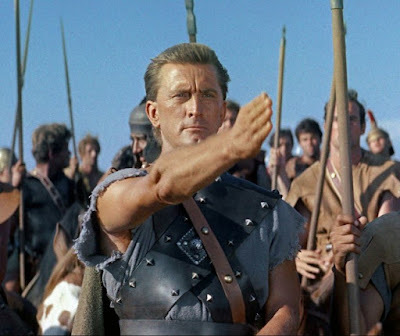 Spartacus speaks from a bluff overlooking a seemingly boundless array of people in which Kubrick's sure use of 70mm makes the crowd not anonymous but a sea of individuals. Saul Bass not only designed the film's striking title sequence, but also served, as he often did with Hitchcock, as the film's visual consultant, designing the gladiator school and storyboarding the climatic final battle between the armies of Spartacus and Rome. The massing of the opposing armies across a vast physical expanse can truly only be fully appreciated in 70mm. The ultra-wide shots of the movement of clotted masses of humanity seen from a great distance rare a visual representation of the appreciation of abstraction that both Bass and Kubrick shared. But there were still more changes to the script to come. In an interview for Criterion Collection, Ustinov - who would be the only person ever to receive an Oscar for acting in a Stanley Kubrick film - says Olivier joined the shoot a week before the others, and had used the time to coral Douglas into rewrites. When everyone assembled for the first table read, Ustinov and Laughton found themselves acting out a script far different from the one they had originally been given. Laughton, believing that his part was being diminished, was enraged. He threatened to sue Douglas, and Ustinov says he walked through the production essentially "waiting to be offended." As a placation, Ustinov and Laughton were allowed by Kubrick to rewrite the scenes in which they appeared. Steven Spielberg has said those scenes are his favorite part of the picture. And they define the political content. 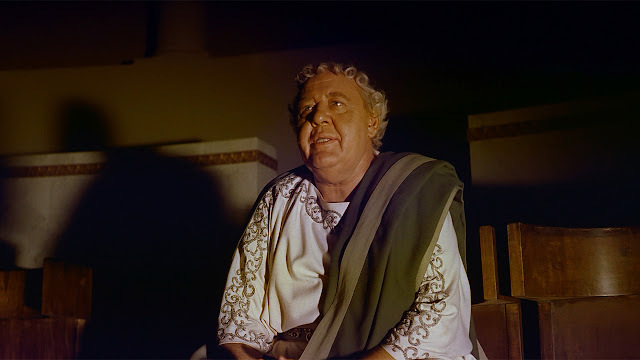 ""I'd rather have a little Republican corruption, with a little Republican freedom," Laughton's Gracchus proclaims to a Senate contemplating giving Olivier's Crassus dictatorial powers, "than rule by Crassus and no freedom at all!" It is not the strongman Olivier but the amiably corrupt Gracchus - corpulent, indecently wealthy, indulgent of his own appetites and those of others, and comfortable with the mechanics of power and persuasion, who, second only to Spartacus himself, is the hero of the piece. If you have not seen Spartacus, do yourself a favor. Stop reading here and go so it. If you already seen it, proceed on. Indeed, the Laughton/Ustinov back end resolves into comedy, not comedy in the sense of a bundle of laughs. No, comedy in the sense of things resolving in a graceful manner, even in the face of gravest tragedy. To me, this is what makes Spartacus a very special film. Ustinov comes to Laughton after he's been whipped and cast out by Olivier, who has has found Spartacus's wife, Jean Simmons, and taken her and her newly born son into his palace. Laughton, surmising Crassus has fallen in love with her, suggests to Ustinov the best revenge against Crassus would be "hurt him where we will feel it most, in his pride" and "steal this woman." "But surely, you're not suggesting," replies Ustinov, "that I steal her." "Add courage to your new found virtues," says Gracchus, plying him with bags of gold. "A round million!" 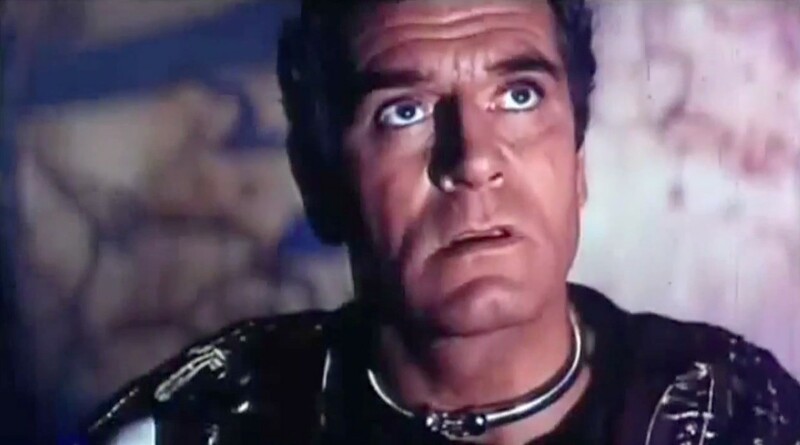 Ustinov finds the feared Crassus dwindling in his mind. "With such a sum," he says, "I could bribe Jupiter himself." "With a lesser sum," replies Laughton, "I have." In short order - with remarkable economy, we never see how he does it - Ustinov returns to Laughton with Simmons and her baby. Laughton passes the certificates of freedom he's created his retinue of female slaves, for Simmons, and "a smaller one for the child." He gives Ustinov even more money, and waves him aside when Ustinov asks where he himself will be going. "Come with us," Ustinov urges. "Make sure I don't mis-spend the money." "Don't be ridiculous," Laughton replies. "I'm a Senator." He sends them on their way, selects the right dagger ("Prettier"), goes to his bath and draws the curtains behind him to commit suicide and deny Crassus still another victory. After the captured slaves refuse to identify Spartacus, Crassus orders them all crucified. Kubrick hatred the film's moralizing and sentimentally. He initially cut from the film the close-ups of Spartacus on his cross. Kirk Douglas attacked him with a chair. The shots remain. I'm sure Kubrick hated it, but to me it's one of the most moving sequences in film, especially so in our current environment, when hope often seems vanquished. Ustinov, Simmons and her child exit the gates of Rome in a wagon, onto a road that is lined with the crucified slaves. As a guard orders Ustinov to come down and show his papers, Simmons catches sight of Spartacus dying on his cross. Ustinov looks at her, then towards what she's seeing, and then sees Spartacus as well. "Not a word," he implores Simmons. "Not a word." As Ustinov talks with the guard, Simmons climbs down from the wagon, walking towards the cross. She holds the baby up to Spartacus, "This is your son . . . he's free. He's free." Ustinov pulls up her beside her, "For the love of mercy, get in the wagon." Watching them ride off, Spartacus dies. That is the final scene. Down a road lined with a seemingly endless procession of crosses bearing the tortured, executed bodies of the vanquished slaves, a small wagon recedes from our view, carrying a former slave seller, a liberated slave, and her tiny child into freedom's exile. Just stumbled on your blog being active again, welcome back. For me one of the best parts of Spartacus is the debate of worlds between autocracy and democracy, embodied in two men. Olivier, with an especially aquiline false nose, the marble coldness of the former, Laughton all the rumpled messiness and humanity of the latter. Laughton apparently envied Olivier all his career, but he wins both Spartacus' woman and their duel.